Food is just food until you try something new, then it's an experience. I ate at an Italian restaurant in Newark, DE for six years, working there for about 2 of them. I practically lived there and still ate there on my days off. It is a local favorite with great food, huge portions and extremely reasonable prices. The name of the restaurant is Cucina di Napoli and if you find yourself in Delaware, I recommend it. 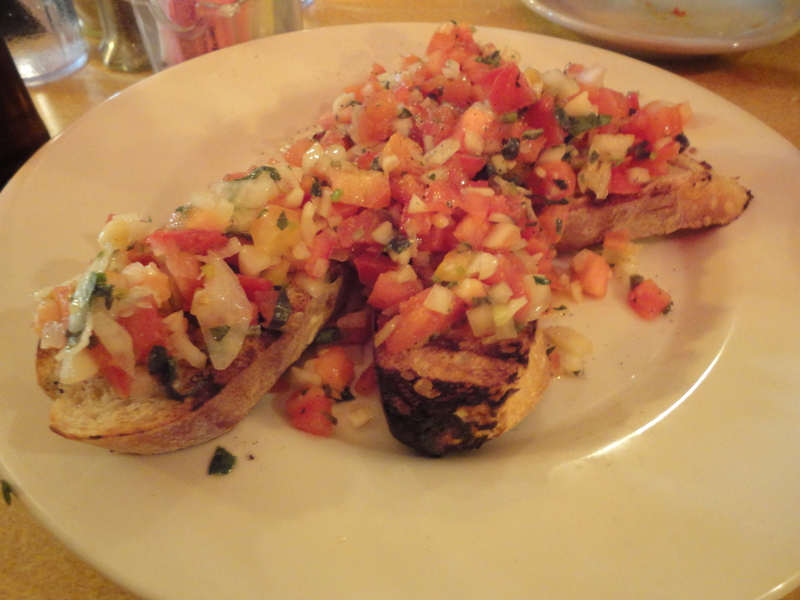 Now, one of my favorite things they have is their bruschetta (pictured above). It may sound silly since this is a simple appetizer, but they hit it out of the park every. single. time. It usually comes with five large slices of bread, perfectly toasted to be crispy on the outside as to not get soggy and soft on the inside making it easy to bite in to and chew. They go the tomato-garlic-onion route with basil and a standard dressing. Absolutely fresh and delicious. I could eat the whole plate as a meal. I recently had some people over for a dinner party and wanted to make a light, yet delicious and satisfying appetizer, so I attempted to re-create this appetizer. The biggest difference is that I added small pieces of fresh mozzarella cheese. Hence the “caprese-style” part of the dish’s title. Overall it was a huge success! So the american-ized version of Bruschetta with the tomatos isn’t exactlyyyyyy traditional – but it is delicious, and it’s pretty close, so who cares? 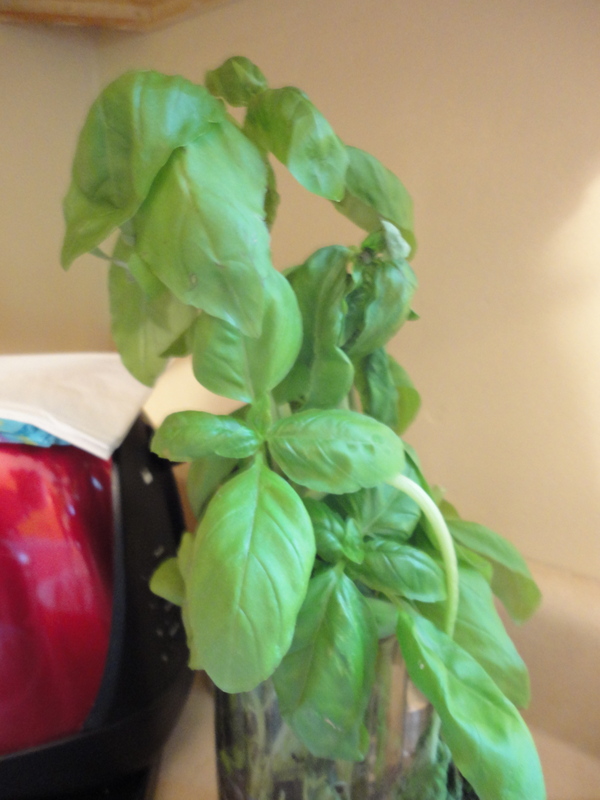 7 or so leaves of fresh Basil – fresh makes a big difference, so I would suggest splurging for it! 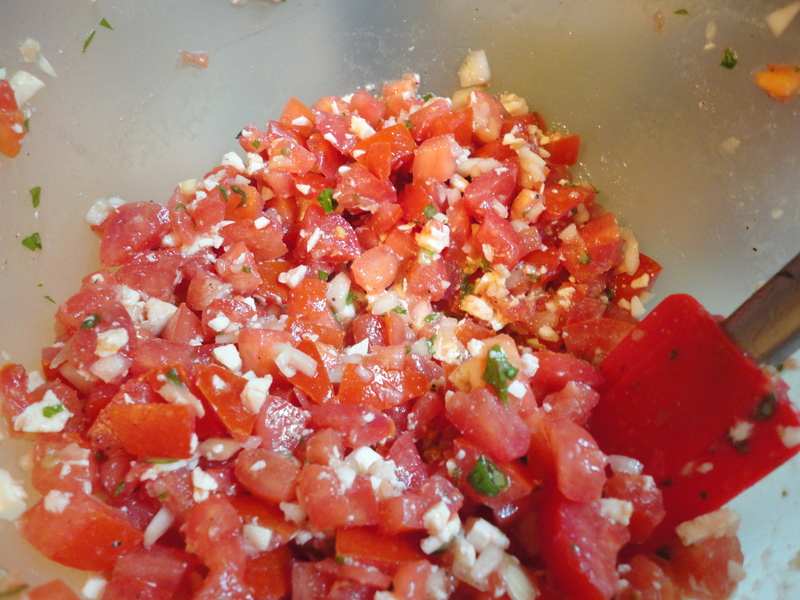 Chop the tomatoes in to small pieces (but not minced!) – For tips, you can go here. Add to a large mixing bowl. Chop onions in to desired sized pieces. If you like the taste of raw onion you may want bigger pieces the same size as a the tomatoes. I like to chop the onions very small – almost minced. Peel and chop garlic. Add to the bowl. fold all Basil leaves together and in half, then chop finely. Add to bowl. Chop cheese in to small pieces – again, any size you’d prefer. For this particular dish I think that smaller pieces, but again not minced, works best. Add olive oil, salt and pepper to taste. I would start with 2 tablespoons of oil, mix, and go from there. Top bread slices with mixture and enjoy! Any other favorite appetizers you can share? !